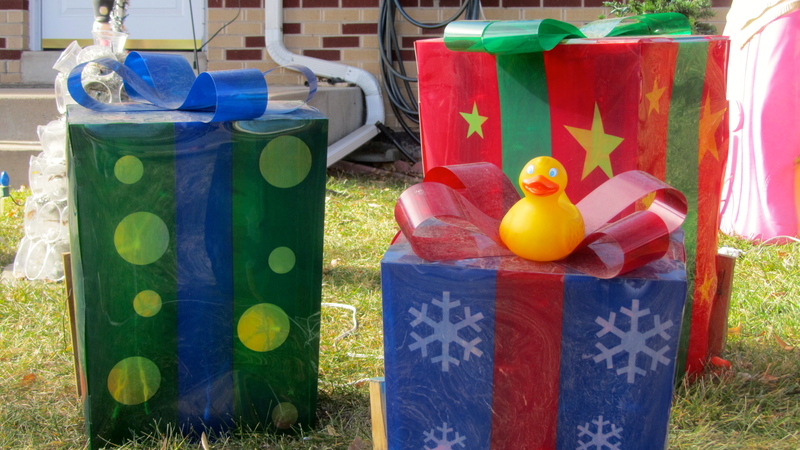 I, Zeb the Duck, have seen Santa’s house in North Pole, so I know he lives here. I also saw this statue of Santa behind his sleigh. 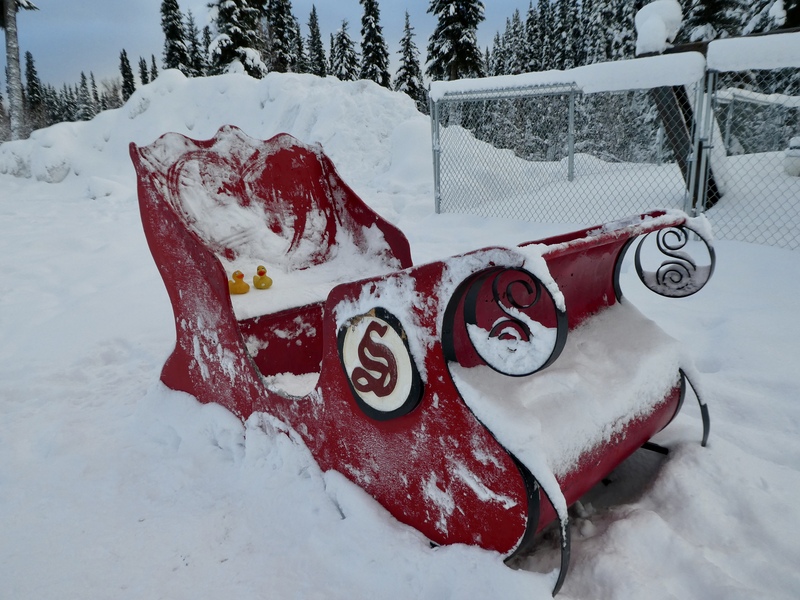 My cousin Eider Duck and I sat in Santa’s sleigh, but we didn’t fly anywhere. We were ready and eager to fly, but the reindeer were occupied. This one was busy eating. 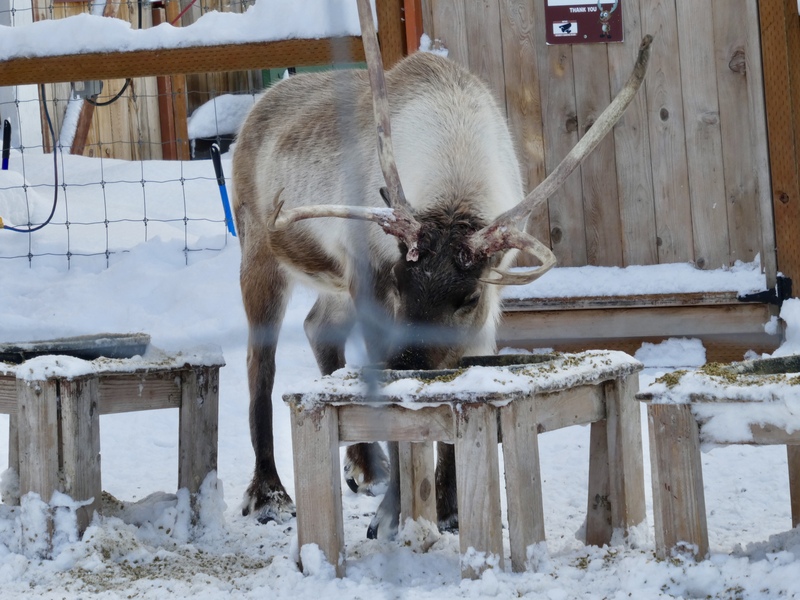 We guess reindeer need to eat to keep energy also. For those of you that are curious, reindeer are also called caribou in Alaska. There are large herds of migrating caribou or reindeer in northern Alaska. But these reindeer are in pens so they are ready to fly for Santa. When we were there a week ago, Santa’s house was not open to the public. Santa is remodeling and many said he is adding a restaurant. Mom has visited there before and she said they sell many great items. Maybe next time Santa will be accepting visitors. 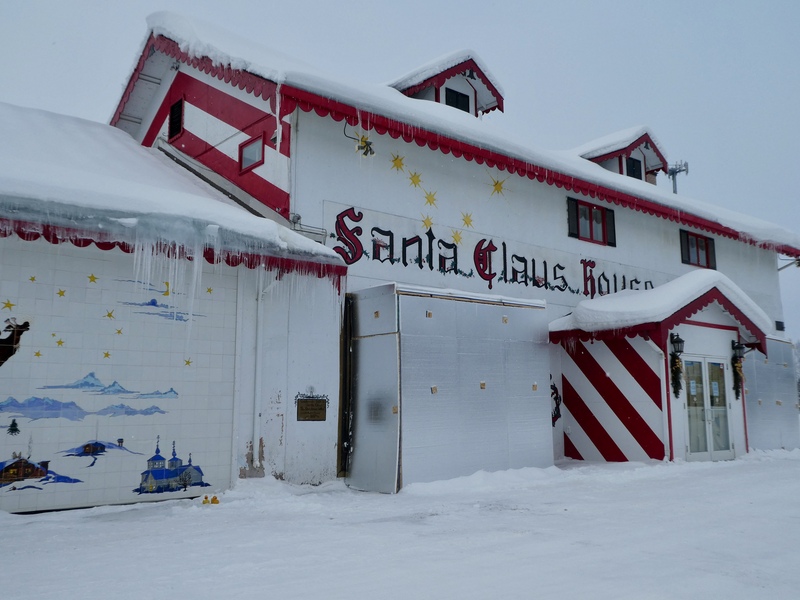 Santa’s House has been there since 1950 and he lives at 101 St. Nicholas Drive in North Pole, Alaska. 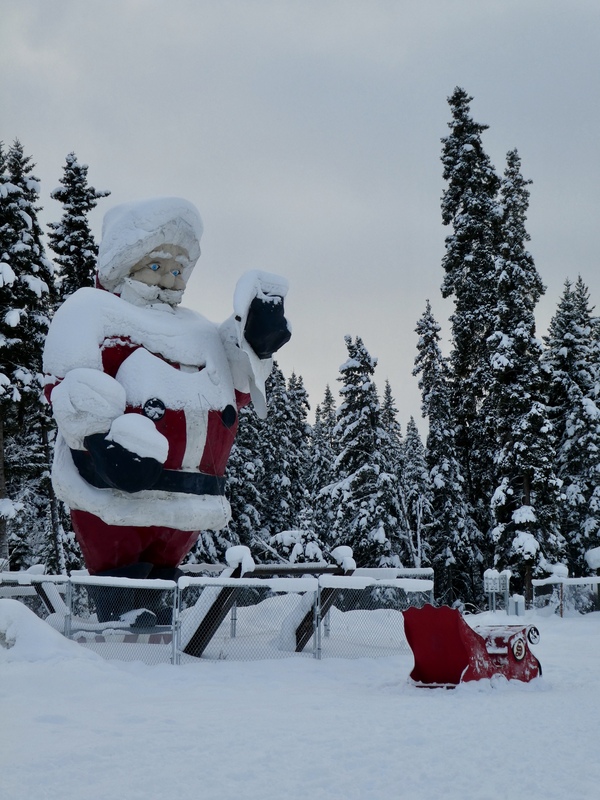 The entire town of North Pole seems to have the Christmas spirit all year. 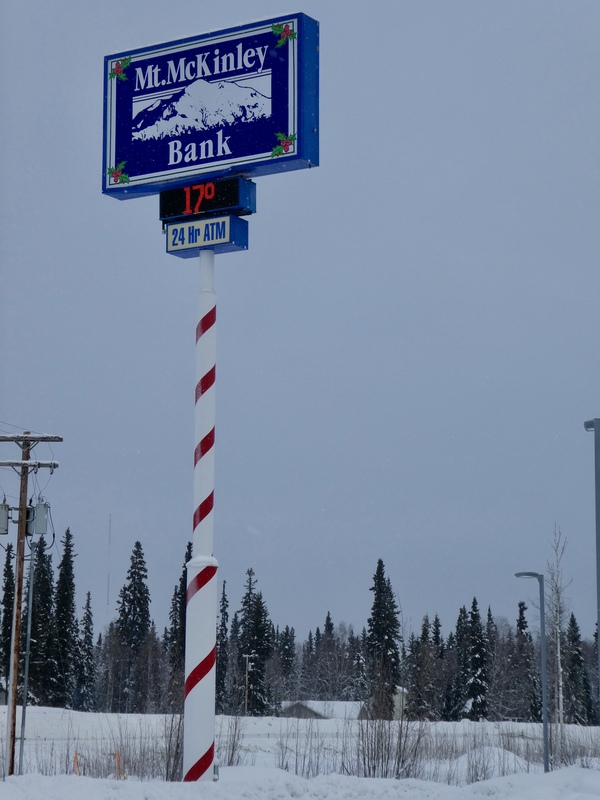 The pole for the bank sign resembles a candy cane. Yes, that temperature is correct. The weeks before we arrived, the temperatures were well below 0. Often -35 degrees F. Brrrr. But when we were there, the temperatures were above zero, often in the 20’s. That 17 degrees on Mt. McKinley bank sign is correct. 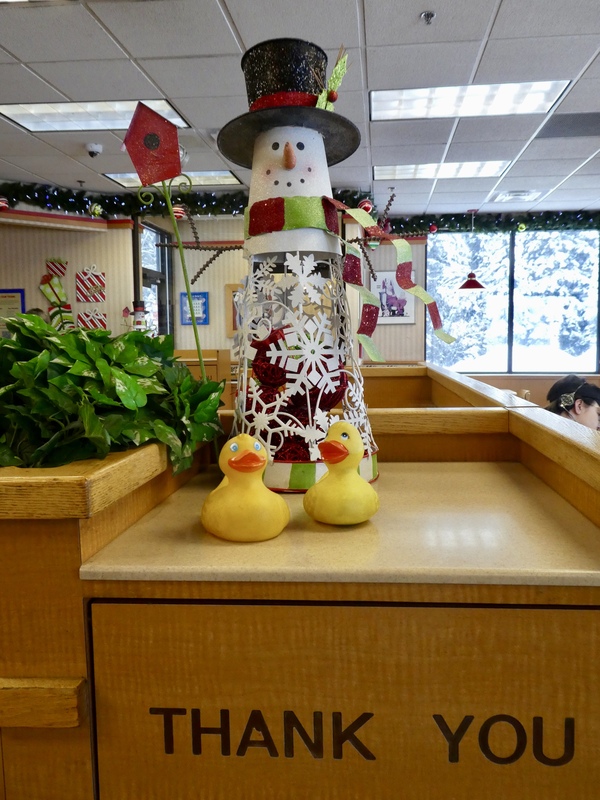 We stopped at Wendy’s and it seemed like Christmas. 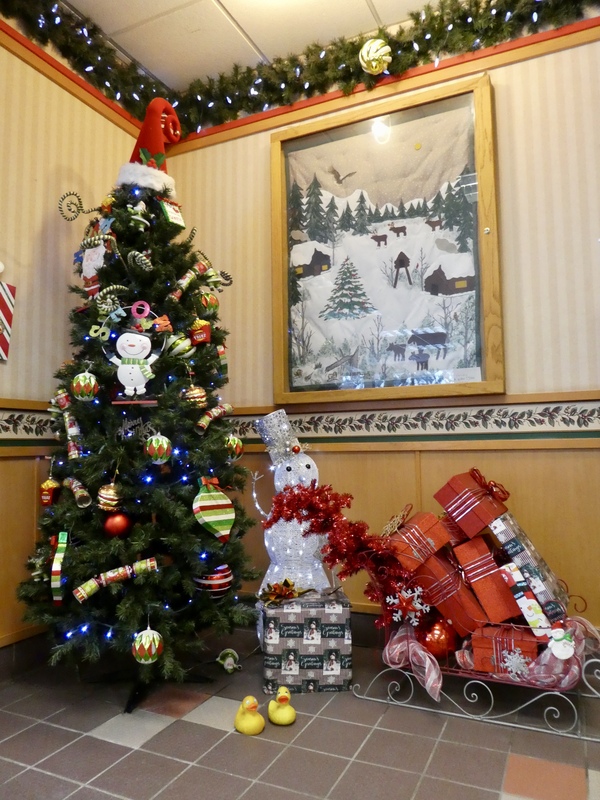 This Christmas tree, presents, and even the picture on the wall remind us that every day can be like Christmas. Even the trash can were decorated for Christmas. Eider says that living there, every day seems like Christmas. We saw lots of signs with candy canes. We enjoyed our time in North Pole. And we have more to show you next time. It is getting close to Christmas. 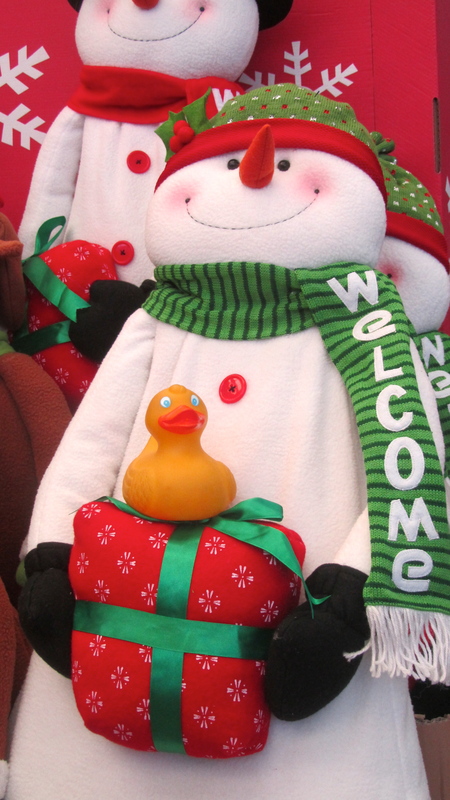 I, Zeb the Duck, am excited about Christmas. But, I don’t really know much about it yet. I am seeing different things appearing in people’s yards. These are Christmas decorations. These are some of the things I noticed. 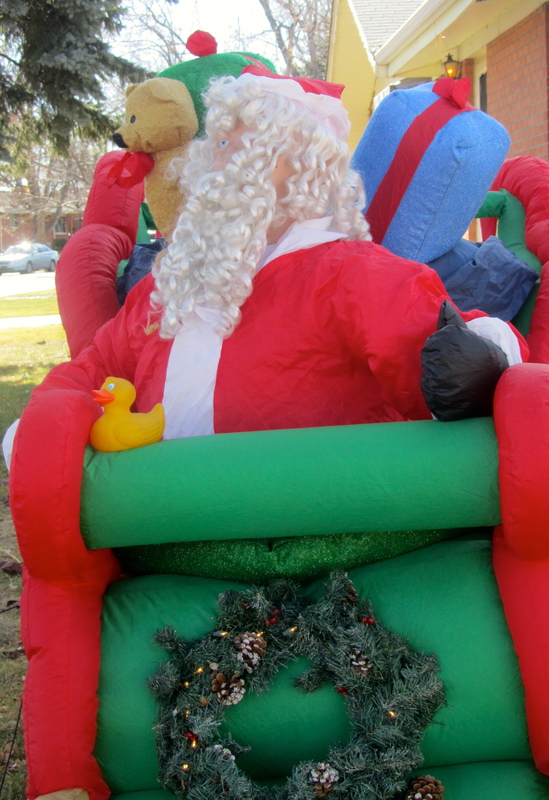 This is Santa Claus in a sleigh. Mom says Santa Claus rides in a sleigh pulled by flying reindeer and brings presents to people. Santa seems nice, but looks a little different. 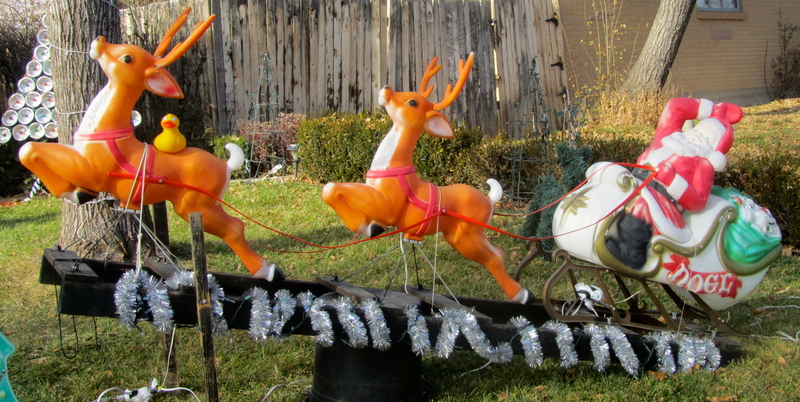 Here is another Santa Claus with sleigh and reindeer. I riding on flying reindeer. Maybe a chair for me?? A snowman and another Santa. These all look like fun things. 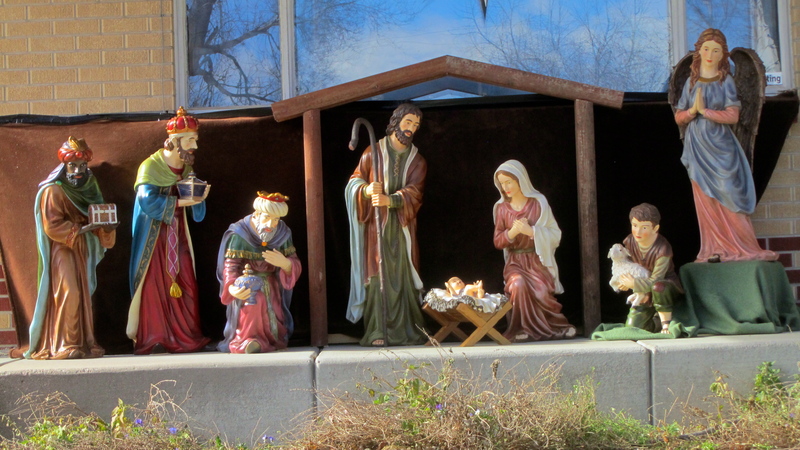 A manger or Nativity Scene seems a little more serious. This is the reason for Christmas. A baby named Jesus was born. This baby grew up to be a special man and he changed the world. Maybe more about this later. I am curious and excited about Christmas. I hope you see decorations and like them. What is your favorite Christmas story or memory? This is all new to me but I like it.